Home Reviews	Sports Afield 24 Gun Safe Review: Is It Really That Good? Finding the perfect gun safe is a big challenge for any of us. Recent research by the Johns Hopkins Bloomberg School of Public Health showed that over half of Americans don’t keep their firearms in a safe place. Of course, it isn’t clear how many of those people haven’t bought a safe simply because they couldn’t find one that was right for them. Yet, it is easy to imagine that a lot of gun-owners struggle to make a decision on this subject. If you have been searching high and low for a gun safe then you might be wondering whether you will ever find a model that suits you. There are certainly plenty of options out there but how will you know which one you should go for? One of the big problems is that most people don’t know enough about the manufacturers involved in this industry. There are some big name, respectable gun safe manufacturers around but you might never had heard of them until you start searching for your own safe. This is why you may be particularly pleased to see this Sports Afield 24 Gun Safe review. If you are already aware of this brand and trust it then you will may be tempted to choose a safe that has their name attached to it. If you aren’t yet familiar with Sports Afield then maybe you would like to find out more anyway. 1 Who Are Sports Afield? 7 How Does It Handle a Fire? 8 What Is the Warranty Like? 9 How Easy Is It to Install? Sports Afield is described as being the “world’s premier hunting adventure magazine”. It was established in 1887. They say that their goal is to “inspire hunters” with exciting stories about adventures. It is the oldest outdoor publication in North America, with early copies at the end of the 19th century selling for 15 cents each. They are well known for having spoken out on concerns about the environment and conservation long before it become popular to do so. The magazine is now owned by Field Sports Publishing in Huntington Beach, California, who bought it out in 2002. They have moved with the times and now have a popular website too. You may also have seen the World of Sports Afield TV show that was brought out on The Sportsman Channel in 2010. Their site includes a section on guns and other hunting gear. It is easy to see that they are experts in this area and that they have a lot of experience to pass on to the public. Sports Afield branded products have been available since after the end of the Second World War. In recent years they have extended their range and offer all sorts of things with their name attached to it. For example, you can get Sports Afield camping equipment, cutlery, clothing, and even log cabins. Given their long years of expertise in hunting matters it is no surprise to see that they also now offer gun safes too. There are a number of gun safes with the Sports Afield name on them, so it is important to make sure that you are looking at the right one when you are looking at the details. The one we are looking at here is a big safe that is designed to hold up to 24 firearms in it. In fact, it is advertised as fitting in 24 long guns or rifles and 4 handguns. They have bigger safes that can fit up to 40 long guns if you need more space. As usual, this figure is the absolute maximum number of guns that you could cram in. It is likely that you only use it to store a lower amount if you want them to be neatly ordered and to stay undamaged. This model is part of the Sports Afield Standard Series of safes. They are all bit, sturdy models that look good. The main difference between them all is the size, as there are models for gun-owners with different sizes of firearm collections. In terms of the different size options that you have, there are models for just about any size of gun collection in this range. These are typically 60 inches in height, with the width and depth varying according to have many firearms are meant to fit in there. Be sure to check that you have enough space to fit in the safe that you are interested in. You also need a solid base for it. The Sports Afield gun safes are extremely heavy and the biggest models run from 395lbs up to a massive 500lbs. The way that a gun safe looks might seem like a fairly trivial point to you at first. After all, the most important thing is that it is sturdy enough to keep your firearms safe and secure at all times. You may also be more interested in the features than in the looks. Some people intend to hide their safe somewhere out of sight anyway. In this case, the appearance matters less, as there isn’t any risk of it becoming an eyesore in your home or looking completely out of place. putting it in pride of place in your house. 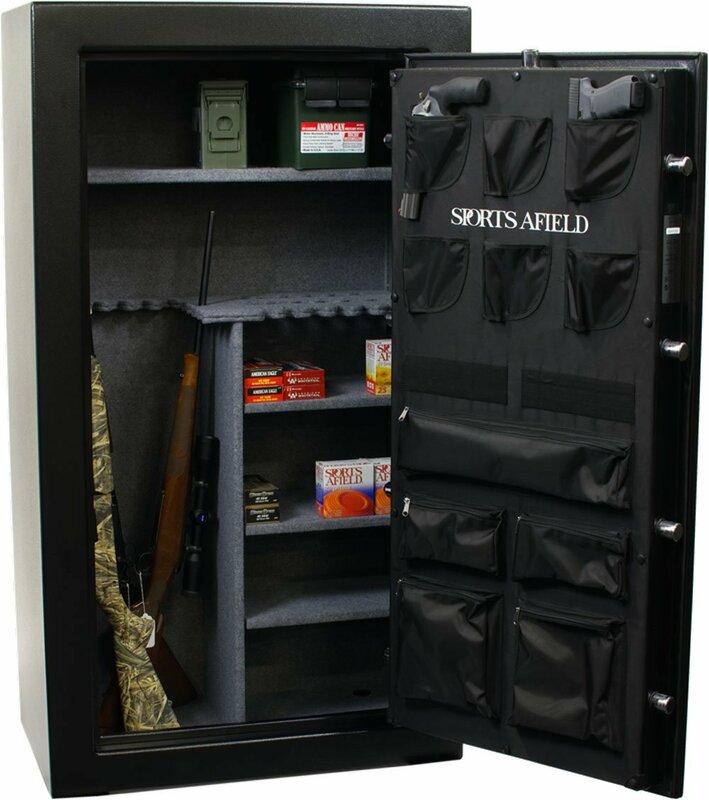 In this case, you will be pleased to see that the Sports Afield 24 gun safe is attractively designed and very easy on the eye. It looks sturdy and dependable but it also looks pretty stylish too. The black finish means that it can blend in just about anywhere that you might want to put it in your home. You probably won’t be buying this model purely for its looks but there is no denying that it looks impressive. As for any intruders who come across it, they are sure to feel daunted by the idea of trying to force open such a big, robust looking safe. You shouldn’t under-estimate the power of a tough-looking safe in simply putting off thieves from even attempting to bust it open. One of the most vital aspects of any safe is the lock mechanism that controls the door opening. You need this to be tough enough to keep out intruders but also easy for you to open without any sort of fuss or delay. If you are going to need to get a gun out in an emergency then you can’t afford to be messing about with locks. The good news in this respect is that Sports Afield gun safes use illuminated electronic locks. This means that it is easy to find in the dark and then simple to open using your personal code. Some people prefer biometric scanners but numeric keypads are also very effective as well as typically being a good deal cheaper. This code is fully programmable so that you can use whatever sequence you feel that you will be able to remember most easily. Importantly, the keypad can also be set to silent mode when you don’t want the beeping sound that accompanies the press of every button otherwise. As you would expect, there is also a backup key to ensure that you never run the risk of getting locked out of your own safe. It is a good idea to store this key somewhere safe that you won’t forget, as you might need it one day when you least expect it. 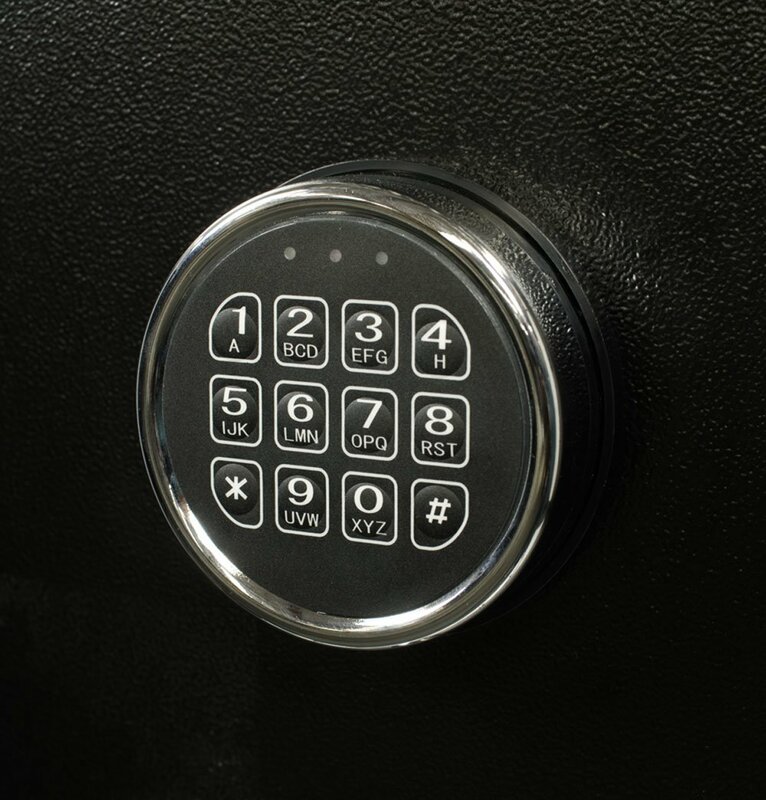 While the lock mechanism is something that it is easy to see and judge, there are other vital aspects that you can’t tell by just looking at a gun safe. Among these is the quality of the construction. Sports Afield safes are made out of 14 gauge steel. This isn’t the thickest type of safe around but it is thick enough for many people’s needs. Certainly, if you want something thicker then you will probably need to pay a good deal more for it. Their safes also come with 12 tough bolts that are made out of 1.25 inch steel. The door is recessed, which means that it is almost impossible for thieves to pry it open. As we saw earlier in this Sports Afield 24 Gun Safe review, this model is designed to give you space to store up to a total of 24 long guns and 4 handguns. When a safe is as big as this it is important that you are able to neatly organize the interior and put everything in the right place easily. A good array of shelves and barrel rests means that you can store a number of guns without them all banging together or being difficult to get out again when needed. The shelves are adjustable and removable, so you can move them around until you get the perfect layout for your needs. Inside the door, the bigger Sports Afield models also offer storage for handguns, which is very handy if you have a big collection of firearms. How Does It Handle a Fire? If you have looked for a fireproof gun safe in the past then you will already know that not all safes offer this protection. In fact, you often need to step up to the more expensive models to find one that keeps the firearms safe in extreme temperatures. Thankfully, the Sports Afield gun safes are designed with fire and smoke seals that keep the contents safe from damage. They are rated as being fireproof for up to 40 minutes at 1200 degrees Fahrenheit. This might not sound like a big deal but even very expensive gun safes tend to not offer much more than an hour of fire protection. The benefit of having a fireproof safe isn’t just in terms of keeping your firearms safe from damage. It also means that you can choose to keep other valuables in here too. Indeed, a lot of people put their most important papers in here along with their guns to keep them as safe as possible. When you buy a large gun safe like this it is a big purchase that you need to take great care over. This sort of safe doesn’t come cheap and there is every chance that you expect it to last the rest of your life. Therefore, getting a warranty is going to make you feel a lot happier about the prospect of your new safe lasting you years without giving you any trouble. So, what is the Sports Afield warranty like? The truth is that they offer one of the best warranties around. For a start, they give all of their safe products the backing of a comprehensive, no-hassle lifetime warranty. It doesn’t matter whether your safe is stolen, flooded or damaged by fire, they will replace it for you. You also benefit from a lifetime guarantee on parts, paint and locks too. In addition, you get a free locksmith service if you ever find yourself locked out of your safe. Check out the video below to see a good look into the inside of the sports afield gun safe! We all have different ways that we want to use our gun safes. This means that we have varying needs when it comes to fitting them. Some people want to bolt their safe down to a concrete floor while others will hide it away or just put it in a corner. However you plan to use it, the Sports Afield 24 safe is easy to fit. It comes with 4 pre-cut holes that allow you to anchor it to the floor very easily. With a built-in internal AC power port and USB ports you can get up and running in no time. It is also worth pointing out that the door is completely removable. This makes it a lot more manageable to move the safe around and also to organize the contents when you first get it. Of course, a safe like this is big and heavy, so it isn’t easy to move around. This makes it important that you think carefully about where you are going to put it in your home once it arrives. This is a solid and dependable gun safe that it is easy to recommend. Of course, that doesn’t mean that it is right for everyone. Since we all have different needs and budgets it is clear that we all need to find the gun safe that is perfect for each of us. Having said that, the flexibility and overall quality of the Sport Afield gun safes mean that it is an easy choice for many gun-owners to make. This is the kind of safe that you can buy with confidence and look forward to using for a very long time. It is worth repeating that this Sports Afield 24 gun safe review is based on the model that can fit in 24 long guns. If you need more space or feel that this is too big for you then there are other options to consider in the Sports Afield range.